A Mere F.I.R Wont Bring Justice To Rohith Vemula Even In Death! [Published in Counter Currents.] The tragic death of a young Dalit scholar Rohith Vemula in the University of Hyderabad is not merely the death of an individual. The sordid saga behind what drove him to take this extreme step exposes all the pretensions of the republic and its institutions. It exposes how the regressive structure of caste mobilizes the entire system against the Dalits, the ex-untouchables, six decades after untouchability was abolished by the constitution.. The facts that led to his suicide are horrible, to say the least. They indict many in powerful positions. Take for example, the intervention of Union Minister Bandaru Dattatreya with the Ministry of Human Resources Development (MHRD) that looks after higher education. Mr. Dattatreya had written to the Union Minister for MHRD Smriti Irani about how the University of Hyderabad had become a den of “"casteist, extremist and anti-national politics." These are serious criminal charges under Indian jurisprudence. He sought action against the members of the Ambedkar Students Union (ASA), the organization Rohith belonged to. Mr. Dattatreya made special mention of an alleged assault on a leader of the Akhil Bhartiya Vidyarthi Parishad, student wing of his party Bhartiya Janta Party, by ASA members, despite the proctorial investigation finding no substance in the accusation. The evidence Mr. Dattatreya offered for his charges was ASA’s opposition to the execution of Yakub Memon, a terror convict. Ironically, taking that as evidence for being engaged in anti-national activities would turn many celebrated lawyers of India into anti-nationals for opposing the execution until the intervening night of the morning of his hanging. It would, also, perhaps make the Supreme Court of India anti-national for accepting the petition in an unprecedented 5 am hearing. The MHRD took up the matter despite this apparent absurdity. They sent 4 letters in three months, beginning September 2015, to the University of Hyderabad. They were seeking explanations and actions of ‘anti-national’ activities being conducted in the university by ASA members. The administration of the University of Hyderabad repeatedly denied the charges. To quote P. Appa Rao, the Vice Chancellor. The MHRD did not stop its relentless persecution of ASA members. It is alleged that this is what led to the suspension of the 5 students, including Rohith, from the university and their expulsion from the hostels. This action seems to have been taken because of pressure from both the ministers. Previously it had reversed an earlier revocation of the suspension of the students pending a fresh inquiry by a new committee. It was handed over, based on the recommendation on the old one-students accused to be biased against them. Suicides of Dalit students in premier educational institutions of India, is nothing new. Many studies have documented this fact. Yet, the brazenness with which this one seems to be forced onward is something never seen before and must be treated seriously. Rohith was not fighting an individual battle. He was part of a bigger struggle based on Ambedkarite values. He could laugh off injustices and trivialize them while fighting against them. His letter to the Vice- Chancellor on 18 December 2015 gave evidence to both his zest for life and his increasing loss of faith in the capacity of the administration to deliver justice to Dalit students. To quote the suggestions he offered to the VC. “1. Please serve 10 mg. Sodium Azide to all Dalit students at the time of admission with directions to use when they feel like reading Ambedkar. No sane person can miss the hint of what was coming in these terse suggestions. The fact that the university went ahead with the decision of overturning its own decision and punishing them afresh makes them criminally negligent towards human life-if not outright criminally culpable. And yet, I am afraid to say, that a legal redress is almost an impossibility in this case, as in countless others of a similar nature. Take the fact, for instance, that Rohith’s suicide note categorically exonerates all his enemies while taking all the blame for his suicide on his own. 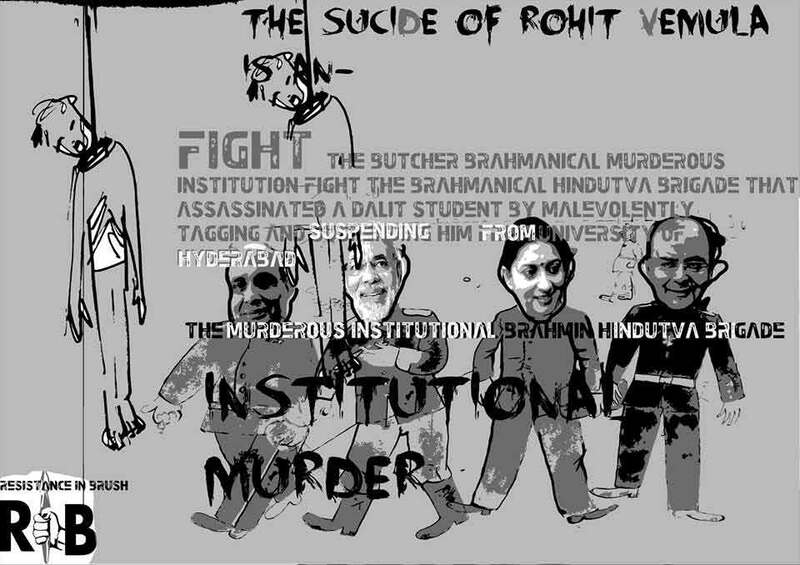 Take also the fact that Mr. Dattatreya, though evidently complicit in pushing Rohith into taking the extreme step did never mention him or any other ASA member individually. Further, he sought only an intervention from the MHRD to cleanse University of Hyderabad from ‘anti-national’ activities. MHRD, too, on its part would come up with similar arguments. It would, most probably, argue that it merely took cognizance of the concerns of a local member of parliament and forwarded it to the university concerned despite the fact that it shot 4 letters in three months. The Vice Chancellor, on his part, would blame it all on the ‘collective decision’ of the Executive Council while knowing well why the council reversed earlier decisions and went ahead with punishments. Bring in the battery of lawyers they would have to exploit these loopholes and the recipe for injustice to Rohith even in death would be complete. So what do we do? Where do we go from here? The answers to this questions are hard to come by but the way to redress to Rohith would open only in seeking those difficult answers. An easier said than one comes handy- a relentless, focussed socio-politico struggle for justice for Rohith on the sidelines of the legal battles waiting for us. A struggle that would require us to ensure that Rohith’s harassers never forget him, that we go to their constituencies with his pictures, his life and message and tell the people what the perpetrators have done to him, perhaps the only way to break the cordon of impunity their positions of power provide them with.